Turbo 7019. 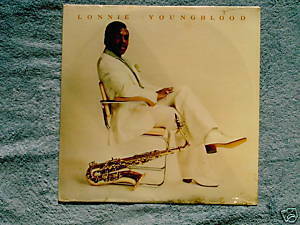 Lonnie Youngblood's 1977 LP includes Happiness Is Music, Lonnie Blow Your Horn, On Top, Nothing Can Go Wrong. Bandleader is best remembered for hiring young Jimi Hendrix. Youngblood's sax is influnced by King Curtis and Louis Jordan. LP produced by George Kerr and Sylvia Robinson. Album photography by Kay Rita. Sealed LP; cover with photos is VG with some corner wear and staining on bottom.